Anthony Anderson was born in Compton, California on August 15, 1970, and attended the High School for the Performing Arts in L.A. 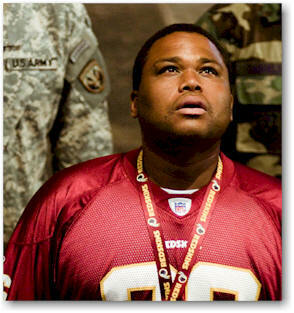 He returned to his hometown after graduating from Howard University to take a shot at showbiz in Hollywood. Since his breakout role opposite the late Aaliyah in Romeo Must Die in 2000, he's enjoyed a meteoric rise courtesy of a string of successful outings which has included such hits as Big Momma's House, Me, myself & Irene, Barbershop, Two Can Play That Game, Scary Movie 3 & 4, Harold & Kumar Go to White Castle, and The Departed, which won the Oscar for Best Picture earlier this year. On TV, he starred in All about the Andersons, a short-lived, eponymous sitcom on the WB network, and he has also enjoyed recurring roles on The Shield, Bernie Mac, Ally McBeal, and ’Til Death. And he's recently agreed to do a cop series for Fox, to be set and shot in New Orleans, called K-Ville. Anthony is married to his college sweetheart, Alvina, and the couple lives in L.A. with their two kids, Kyra and Nathan. Here, the gifted, gap-toothed funnyman talks about his latest work in Transformers, where he plays computer geek Glen Whitmann. KW: Were you familiar with Transformers before taking this role? KW: Tell me a little about your character, Glen. AA: I'm brought in to help decipher this computer language that the Autobots and Decepticons are speaking. It's a computer language that no one can seem to decipher. So, they come to the smart guy. I have a computer hacking problem. I've actually hacked into the Pentagon a few times. I do things that I shouldn’t do with my computer. I've escaped being caught, yet for some reason, I'm just drawn to it. It excites me, even though I know what the ramifications could be. I've actually been warned. They could never prove anything, per se, but I've been given stern warnings from the government and our local authorities about the activities that I do. But they can't prove anything, because I'm just a tad bit smarter than them. KW: What did you think of the movie's sets? 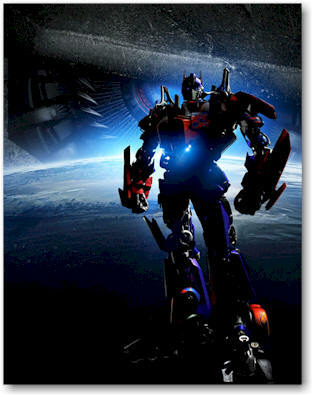 AA: The first time I walked onto the Megatron set, I said ’Wow!’ I did. I had my son with me that day, and his jaw dropped. He was just as excited as I was. 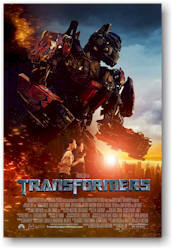 KW: What would you do if you encountered a transformer in real life? AA: [Bleep] on myself. Excuse, can I say that? You can bleep that out. I'd be petrified. But I tell you this: I'd get in the car. That's my personality. Because, if they’re rolling up on me like that, whatever's going to happen is going to happen anyway. And I'd want to be a part of it. KW: Are you happy with the film? AA: All I know is that we have a great film that is going to go through the roof and knock people's socks off. And possibly convert the naysayers, if there are any out there. But trust me, when they see this, it's going to be unlike anything they've ever seen before. KW: Tell me a little about the plotline of your new TV series, K-Ville. AA: I don't know where it's going. The just finally assembled the writing staff. We start shooting July 17th in New Orleans, and I'm looking forward to it. I don't know what direction it's headed, or what's going to happen. All I know is that at the end of the pilot episode, you're sitting there watching it, and you want more. As I watched it, and the credits started to roll, I went ’Wow! I want to see what's going to happen with these guys next week.’ But I don't know where the scripts are going. KW: How is the recovery coming along in New Orleans? AA: While shooting the pilot there, the Lower Ninth Ward was still completely decimated and destroyed, 19 months later. Just a barren wasteland’ And not only that community, but the surrounding communities and parishes, too. I think that's indicative of what our government will do or won’t do, and of its lack of a war on poverty. It was a shame to sit in a community with people who lived through this and to see the lack of help they’re receiving to this day. That's why I applaud Fox for having our show there, for bringing jobs back to the community, and for lending a helping hand in rebuilding the region. I don't think we can rest on our laurels and think that our government will do what we want it to do. We have to do it ourselves. And I'm going to do everything that I can to help rebuild that community, because it's now going to be my community. I'm going to be living there, God willing, for the next six, seven, eight or nine years. So, that will become my family and my place. KW: Are the people coming back? AA: Yes, people are coming back. People are there, but they need something to come back to. If your whole life was washed away in a storm, what is there for you to come back to, if you have nothing but the clothes on your back? They’re making their way back, but they need some place to come back to. You can't come back to dirt. KW: While making this movie in Hollywood, did you ever reflect on the fact that you grew up on the other side of the tracks before making it to the heights of showbiz? AA: All the time. I was actually born in Watts on 114th in the Nickerson Gardens. And Tyrese [co-star Tyrese Gibson] was from the Jordan Downs Projects right up the block. So, we would always sit down, and joke, and talk about that. We did reflect not only on where we came from and where we are now, but on what we're doing to bring the next generation of Tyrese Gibsons and Anthony Andersons and Venus and Serena Williams from those communities, and to bring them hope and to let everybody know that if you have a dream, you can achieve it, if you believe in it, and stand fast, and hold on to it, because we're living testaments to that. That's mainly what we talked about, about how both of our charities could come together and give back to those communities that we're from, and let them know that anything is possible.